This blog entry written with substantial input and support from Meredith L. Patterson. Aspiration has taken on Weaponized Social as an extension of our commitment to solidarity with our community and to equality in our interactions with and through technology. When I came on with Aspiration in January, it was clear in my soul why the joining up made sense. But not many folk in the disaster and humanitarian response circles I run in pay much attention to the overlap of activism and response. It took some time to make it clear and explicit. Chaos Communications Camp, like the World Cup, is something so special that it only happens once every four years. It’s a few thousand hackers, artists, and activists camping together in Germany. We come together to share skills, stories, and ambitions, including how to get into space and provide secure internet in austere places. There’s brightly colored hair everywhere, and a slowly improving gender ratio, and stickers on laptops, and a gig of data to your tent. At Aspiration, we strive to apply community organizing principles to all the work we do. In practice, this means the principles that guide our greater mission should be embedded into internal organizational processes. For example: how does one approach website design or event facilitation with a frame of inclusion and collaboration? In the case of online communications: how can the principles that guide face-to-face organizing be applied to the digital realm? 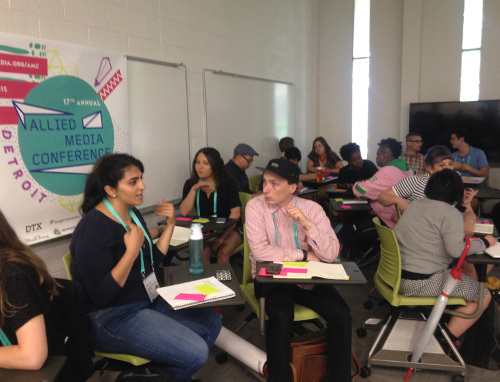 At the Allied Media Conference in June, we were given space to host a workshop that explored these ideas. Titled "How to do Online Communications as an Organizer", this session asked participants to think about how their on-the-ground experiences could be applied to communications tactics. We shared some planning templates (Publishing Matrix!) in the process, but ultimately, participants led the exploration and found their own ways to apply their knowledge.